Markdown is a way to write content for the web. It’s written in what's called "plain text", which is exactly the kind of text you’re used to writing and seeing. Plain text is just the regular alphabet, with a few familiar symbols, like asterisks (*) and dashes (-) thrown in. Unlike big word processing programs, text written in Markdown can be easily shared between computers, phones, and people. It’s quickly becoming the writing standard for academics, scientists, writers, and many more. Websites like Reddit use Markdown to style and format their comments. Formatting text in Markdown has a very gentle learning curve. It doesn’t do anything fancy like change the font size, color, or type. All you have control over is the display of the text—stuff like making things bold, creating headers, and organizing lists. But the best part about Markdown is that you can easily switch over to HTML when you need to style an email or use a pre-designed template. 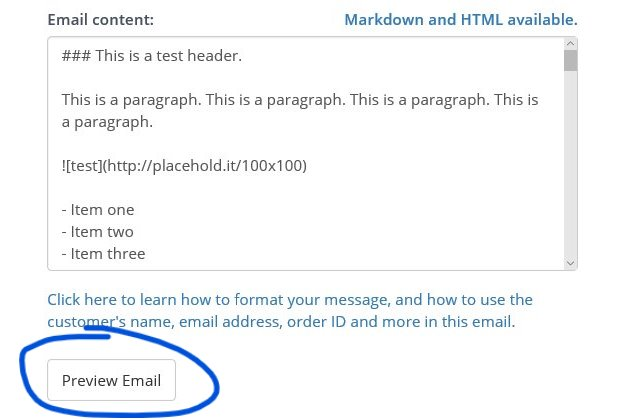 In fact, all Markdown content is converted into unstyled HTML when your automated email messages are sent. For this reason, using Markdown is typically better suited to sending quick email messages that don't require any branding or design; conversely, using HTML is better suited for sending out a branded or pre-designed message. When it comes down to it, Markdown is first and foremost meant to be readable. For example, if you wanted to bold a piece of text, you would just have to write **my bold text**. To get the same effect using HTML, you'd have to write <strong>my bold text</strong>. Similarly, if you wanted to italicize a piece of text, you'd write *my italicized text* in Markdown and <em>my italicized text</em> in HTML. # This is the largest heading. ### This is a smaller heading. Moving on, Markdown also lets you easily create numbered lists — just type the number followed by a period and space, making sure you separate each item onto its own line using the Enter or Return keys on your keyboard. To nest lists, all you have to do is increase or decrease the indentation. Finally, creating links and images with Markdown is just a tiny bit more involved. To create a link, you'll need to surround your link's text with square brackets, then immediately follow those brackets with a pair of parantheses containing the URL. While we recommend that you use Markdown to format and send your automated email messages in Stages, we realize that it doesn't cover all situations. Luckily, Markdown actually lets you switch over to using HTML whenever necessary, simply by typing some HTML. With that said, you must keep in mind that you cannot use Markdown inside of an HTML tag! We strongly recommend that you use Markdown over HTML, unless you have a pre-designed template to use, or you've previously used HTML in the past and you're intimately familiar with it. Even one small typo — such as missing a slash in a closing tag — can completely goof up your email, causing it render improperly in the recipient's inbox (or to not render at all). If you're not quite sure about your newly learned Markdown abilities, you can freely experiment with a Markdown editor at http://markable.in/editor. Just type your text and Markdown into the left side of the page, and you'll instantly see it rendered and formatted on the right. Additionally, you can preview your automated email messages in the Stages app itself by clicking the 'Preview Email' message when you're editing an automation message. If you have any questions about using Markdown or HTML in your automated email messages, just send a quick email to support@getstages.com. We'd be happy to help. Click here to head back to the docs.